Meet the Social Channel of Value, the new arena where brands compete for user (customer, client) attention and loyalty. Product features are losing their ability to differentiate because they are copied so easily. Moreover, the Social Channel of Value will transform human decision-making, organizations and institutions because it digitizes sociality, a core human trait, and its power will dwarf the power of the product and the brand. CEOs, CMOs and CPOs have a very rare social business opportunity to harness the Social Channel ahead of competitors and remake their markets. These are strong statements, but bear with me and I think you’ll appreciate why I’ve made them. The Social Channel is the Knowledge Economy‘s analog to the Industrial Economy’s assembly line, which led to today’s brands and mass-produced products. Where the assembly line made fabrication ten times more efficient, digital social technologies will boost human communication and sociality by an order of magnitude. The “Social Channel of Value” shows how product and service features will lose most of their ability to influence buying decisions, which will increasingly be won and lost in the Social Channel—not the Productized Channel where marketers are currently focused. This is Part Two of the Social Channel Trilogy. It will help you understand the various facets of the Social Channel. Then you can practice social business at a new level and lead your firm out of the commodity wasteland that confronts so many companies today. The trilogy reveals how companies can combat commoditization by tapping socially-powered innovation. To understand and appreciate the Social Channel of Value, we need to describe its two precedents, the Core Channel of Value and the Productized Channel of Value. After describing them briefly, I will show how to use the Social Channel to create uncommon competitiveness. In many cases, you can substitute services where we talk about products. The Core curve is almost linear over time; hand tool innovation and population drive its scale. Although the Core Channel of Value varies somewhat by type of good or service, productization of a good often does not change its base character. Mustard, vehicles, jackets, watches and fences all existed before mass production, but they were made by artisans, far more slowly and expensively. It is useful to recognize that Core Value is independent of its having been productized. Productization does offer an explosion of choice (100s of mustard flavor/texture choices) because mechanized production drives down cost significantly by introducing scale. Coffee: warm drink (with a pastry), a lift, a meeting or conversation, a nice taste, a break. Vehicle: transport, prestige, whether Karl Benz’s 1885 Motorwagen or the 2012 Porsche Carrera. Banking: depositing money, earning interest, borrowing money. All of these have existed for centuries, and the traits mentioned are in the Core Channel of Value. Notably, if something were to interrupt mass production or distribution, the Core Channel would still exist. The variety and character of the user experience would be different, but it would prevail in the absence of mechanization. The Productized curve has peaked over time, and it is currently in decline. Speaking generally, the Productized Channel of Value changed the economics of things profoundly because machines have made fabrication so much more efficient. In order to enable goods to be fabricated or processed by machines, engineers followed the process of mechanization, in which basic steps were: analyzing the fundamental process (by which an artisan makes a car/mustard/jacket); creating an abstract understanding of what he does; adapting the process to machines, which have powerful mechanical workings but no brains. Engineers break down the creative process, standardize it, compartmentalize its activities and create special machines and operator jobs to work them. At the end of the day, however, we still have largely the same goods and services, but in many different forms, and at different prices. 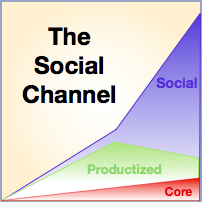 The Productized Channel is built on the Core Channel. Human ingenuity during the Industrial Economy has flowered because it has been so rewarding. For 300 years, we have created unprecedented wealth. We have applied the process of mechanization to virtually every object made by humans today, when very few are made by hand. Machines gave people unprecedented scale to produce and consume things that were very important to us. We have mechanized services, too. Banking, communications, retail (vending machines), entertainment (streaming, no theater required), food preparation (fast food, mechanized restaurants). We have automated administration and supporting processes, too. In another instance of mechanization, the “product” became a platform on which to deliver services. Carmakers generally make little if any profit on selling the car; their money comes from financing and servicing. So we can think of the product as a platform for delivering finance and service services. As explained in Social Channel One, all parts of the world are increasingly “industrialized,” and we cannot escape overproduction and commoditization of products and services that have been mechanized. Because a machine can do it, and we all have highly configurable (software-powered) machines, any new product “feature” that a machine can produce will be duplicated quickly and pervasively by competitors. The fact is, humans scale far less well than machines, and we cannot consume nearly fast enough (we would need to build “consumption machines” ;^). This is the root of the current global “economic crisis.” The value levers of the Industrial Economy are exhausted and will not recover their past form. For examples of post-product and post-service marketing, see Post-Product Marketing and Engagement. The Social Channel fully leverages the network effect to create unprecedented scale; it adds to the scale of the Productized Channel. Sociality is central to human beings’ core survival strategy because we must live in groups to survive. Robin Dunbar asserts that two thirds of all human communication is “social,” talking about others and ourselves. Think about that. When no one is in the room, we are socializing. The snake slithers, the lion hunts and humans socialize, even though we do not admit it. Learn more about this here. “Word of mouth” has always been the most powerful form of product education and influence because it has has existed everywhere. Word of mouth usually takes place locally, among people who live in close proximity, so its familiarity is imbued with high trust, common understanding/point of view and similar motivations. Until recently, word of mouth was invisible to brands and marketing professionals because it was analog; it happened in homes, over back fences, on the telephone. The Knowledge Economy’s digital social networks mechanize thought, creativity, communication and sociality. These are human beings’ core attributes, so the Knowledge Economy will produce even more wealth than the Industrial Economy did. Sociality will be the battlefield going forward, not product features. Because sociality is mechanized, people talking about features is more important than the features themselves. By the way, “sociality” includes collaboration, advising each other and working together on projects; it’s not only about who’s kid did what or the latest sports or Hollywood idol’s score (that’s the stereotype). Most people think of “social” activities as frivolous, and people who think of themselves as “serious” often downplay their social activities. Read the Dunbar review to learn why this is unilaterally false. The Social Channel applies to products and services what has already happened in music, news media, art, video and films. In the Industrial Economy, only producers had the capital to build plants and to finance expensive mass media communications about their products. Now users are involved with many phases of creating and distributing products. People now create “albums” (playlists); people provide more news scoops. Bands and filmmakers got direct to people, who get involved in promoting their favorite artists. Products, from vehicles to ketchup, apparel, dishware, furniture and many others will be designed with user input. When users feel some degree of meaningful ownership, they will often help promote the “product” because it’s partially theirs. User-led design will also happen in B2B, although communities will need to design features that mitigate the risk of competitors within the same market niche gaining proprietary information. CSRA has already done this; it is very feasible in most cases. Group buying will become pervasive, but it will increase in scope; smart manufacturing will enable users to help design and pre-buy products before fabrication. This will completely change the economics of “production” and “distribution” because market risk will be largely removed. How many people buy toothpaste? Millions in each regional market. A small minority will be actively involved in collaborating with brands’ experts, but they will add user relevance and credibility to products. Each active user has networks who live vicariously through active users’ involvement. The network effect amplifies the work of the very few. 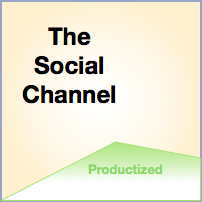 As shown in the Productized Channel of Value, products can serve as platforms from which to deliver services, and the same is true in the Social Channel. People may care less about the product design and more about its impact on the environment, so their engagement would be around the social cause. Examples might be packaging of beverages, automobile design, recyclability, etc. Local services and retail (restaurants, shoe repair, dry cleaners..) will be win or lose by local reviews on Yelp, Google and others, as adoption increases. These businesses will have to manage their reputations very closely and focus on user experience to survive and thrive. Geosocial apps can help with engagement. Professional services (accountants, attorneys, management consultants, engineers, bankers..), when they serve individuals (B2C), will have to manage their reputations as will local services, as rating services continue to grow. Those serving businesses (B2B) will excel when they contribute to social venues in which clients and prospects are asking questions about business issues. In addition, all professional services have always added value by serving as trusted referrals to other service providers. Much of this can be done online. Reputation has always been critical to professional services’ success, but a larger portion of total reputation will be built online by transparent interactions in which they give tips and suggestion online. Healthcare and medical services will see similar impact as local and professional services. Providers will increasingly be ranked and rated by patients publicly. People with similar medical issues will collaborate, often publicly, in forums like Patientslikeme to improve their quality of life and medical outcomes. Providers will thrive by interacting in these venues. Meanwhile, costs and outcomes will be public knowledge. 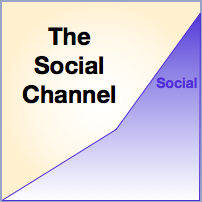 As can be seen at right, The Social Channel is superimposed on top of the Core Channel and the Productized Channel, which are still needed but which have little impact on buying decisions. The Social Channel will increasingly determine buying decisions because product features will continue losing their ability to differentiate since competitors will copy them features more quickly. The speed and degree with which this happens will vary significantly by product type. Products with patents or other barriers to entry will differentiate on features, but others will battle in the Social Channel. All will profit by being active in the Social Channel, regardless of their ability to differentiate on product features. Recognize that the rise of the Social Channel is a “when, not if” proposition. In general, people are social creatures (some exceptions notwithstanding ;^). Digital social technologies enable us to drastically cut the cost of communicating, collaborating and exchanging social information. Meanwhile, the Productized Channel does not add differentiating value; software-powered flexible plants will only increase this trend. Coming off of the 300 year old Industrial Economy, we can forgive ourselves assumptions that used to be valid but are no longer. Chief among these is that people will pay a premium for mass-produced products. Mass customization via the Social Channel and smart manufacturing will give personalization to the most banal products (toothpaste with team colors). This is a bet-the-business proposition. Firms that take it seriously by aggressively approaching social business strategically will realize far higher benefits than laggards. Assess your digital social ecosystem. I have yet to encounter a brand or organization that had a firm grasp of its relevant ecosystem activity. You need to identify which digital social venues have the most relevant conversations. Assess the ecosystem regularly because it’s very dynamic. This is the external view. Based on your assessment of the ecosystem, evaluate what you have to give that has the highest distinct social value to the people you care about most. Create efficient workstreams to deliver your knowledge and expertise to the ecosystem. This is the internal view. Analyze the external and internal views to create your social business strategy. Create pilots to experiment and refine. Pilots are small test projects that keep costs low and help you refine your strategy. Structure social business projects to be small but to test key unknowns in the strategy. Design rapid cycles. Scale the pilots that succeed. Design measurements that provide quantitative feedback on your results. Digital interactions are ideal for providing measurements and results. Make sure to ground your measures in relationship and degrees of trust. Here’s one example. Consider social business models. Keep in mind that these are not mutually exclusive. For example, you can use Crowdsourcing and ProAm in the same initiative. It is imperative that you engage your most important and influential stakeholders online. If you don’t, your competitors will. 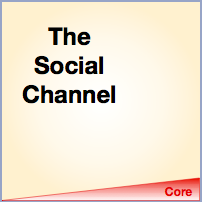 This is the “Front End,” as introduced in Social Channel One. It may be difficult to imagine now, before you have experienced thousands of meaningful conversations with users in digital social venues, but the experience will completely change the outlooks of most organizations. It will teach you that the Industrial Economy “Us and Them” attitude is a fossil (i.e. producers and customers). To be clear, users are not smart in the same way as creators; but they are supreme when it comes to the outcomes they want to achieve. When they interact with each other, they become far smarter. When your experts interact continuously with groups of users, it will supercharge your firm. This will lead to your journey toward mass customization in some form.. or higher product differentiation—if you can engineer significant barriers to entry into some element(s) of your products. Don’t get trapped into wishful thinking here. Engineers are no better than entrepreneurs when they assert how difficult it would be for “anyone to duplicate this” (tech entrepreneurs are famous for claiming that “no one’s doing this”). To prepare for this, explore and pilot alternative plant designs oriented around flexibility and fast retooling. Plants that can make smaller runs profitable. Explore group buying models in which users work with your people to design product ideas—and then pre-order. In many cases, you can give them much more “product” for less money while increasing your profit. This is the “Back End” as described in Social Channel One. As the Social Channel logo suggests, channels co-exist. Firms will continue to differentiate with products, but this will increasingly be a niche play, where it is the rule now. Depending on your business, product differentiation will be more or less viable. However, the Social Channel is coming to everything. Adoption (in this case, of social technologies and behaviors) always starts slowly, then accelerates. People have been experimenting with interacting in transparent social venues for several years. As with Web 1.0 (“the Internet”), early adopters were techies and younger people who liked to experiment, but everyone jumped online after observing. I have predicted that B2B will adopt strongly in 2012-13 because there is a critical mass of skills among users to demonstrate the validity of talking serious business online, and the economy is forcing firms out of their comfort zones.